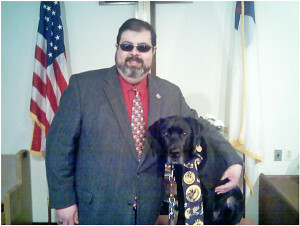 Pastor Darryl Miller with his leader dog, Rowdy. When Darryl Miller decided to become a pastor 10 years ago, he knew it wouldn’t be an easy road to navigate. Being legally blind, he would need help from his family—including wife Shari, and daughters Heather and Kelli—and his congregation. But one of the most important helpers and companions to Darryl has been his leader dog, Rowdy, an 11-year-old beautiful black lab. And now Rowdy is facing his own health issues. Rowdy has been helping Miller gets where he needs to go since 2007, which includes pastoring both Sand Lake United Methodist and South Ensley United Methodist Churches. “He’s been with me from the beginning. Rowdy’s been to seminary and through all of my pastoral training. He’s older now, and we are trying to retire him but he just won’t go,” said Miller with a chuckle. Rowdy has been through several surgeries to fix a fistula—a hole in the roof of his mouth that opens into his nose. Miller said the hole is about the size of a quarter, making it hard for the dog to eat and drink well. Rowdy has undergone five surgeries to fix the problem, but every one has failed. And the costs keep piling up. “We recently found out the jawbone was infected as well, and that’s why the surgeries failed,” explained Miller. He said Rowdy was put on a 10-week course of heavy-duty antibiotics to clear it up. The veterinarian—Dr. Moore, in Spring Lake—will then attempt to repair the fistula again. The Sand Lake United Methodist Women’s group would like to help Pastor Miller by doing some fundraising for Rowdy’s surgery. They will be holding a hot dog and chili lunch at Sand Lake United Methodist Church, 65 West Street, Sand Lake, on Saturday, January 14, at from 11-3. For those who would like to donate, but cannot attend, you can make out a check to the Sand Lake UMC Women and put “Rowdy” in the memo line. Mail it to Sand Lake United Methodist Church, PO 97, Sand Lake, MI 49343.